So not too surprisingly – with winter well and truly here – on a recent trip to the supermarket I found myself taking a slow stroll through the dessert aisle. What struck me horror however was not the nutritional information. Right next to the panels are the ingredient lists which I found to be full of ‘artificial this’ and ‘additive that’ – and very little in the way of anything natural or real – yuck! As I said here, I’ve always taken a fairly balanced approach to eating – eat what you want, as long as it’s in moderation and you make it yourself from raw/fresh ingredients. A home made pudding was the obvious option. 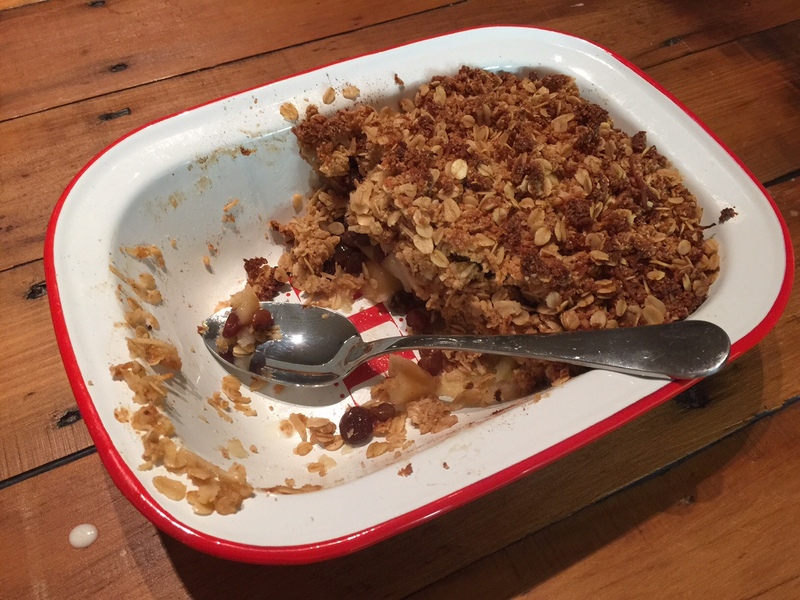 Traditional apple crumble was one of the first desserts my mother taught me to cook as a child – but it’s normally made with flour. I’ve been substituting flour with almond meal a lot recently – not only to minimise my wheat (carb) intake, but also to choose a higher protein option instead – so figured I’d have a go at making the crumble with almond meal. I’d never done this before – so I made the recipe up as I was going along. Peel and cube apples and gently boil in wanter until starting to soften. Drain apples and put into base of an over-proof dish. Mix in 1 tsp of cinnamon powder and the sultanas. In a bowl mix the almond meal, oats, sugar and butter – then put on top of the apple base. Bake in an oven at around 170 degrees for about 30 minutes – or until starting to brown on top. It was a bit of an experiment – but it actually worked – and is now on high rotation throughout winter in our house.